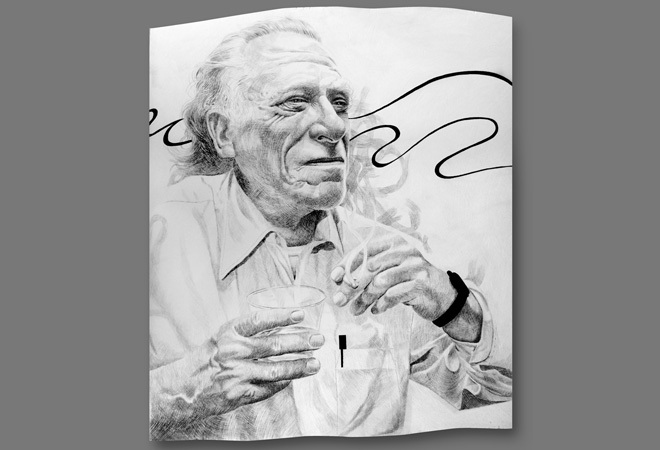 "El Pinche Buk" by Abel Alejandre (2012); graphite and acrylic on primed wood; 20" x 24"
Bukowski is also featured in the work of Tim Youd, whose recent week-long conceptual performance piece outside the downtown Terminal Annex Post Office drew considerable attention as he typed out two entire novels by the “poet of Skid Row” on a single 8 1/2″ x 11″ piece of paper each, scrolling them over and over again through original mid-century typewriters. The resulting tattered, ink-drenched sheets are now on view, along with Youd’s sculpted reproduction of the mid-century Underwood Champion machine he used to bang out one of the books. These creations by Alejandre and Youd mingle with works in black and white by five other artists on the walls of the Chinatown gallery. Only William Solomon’s broken throne in gold at the center of the gallery floor provides a colorful counterpoint. The Summer Group Show runs through August 31 at Coagula Curatorial, 977 Chung King Road, in Chinatown. The gallery is open Wednesdays through Saturdays from noon to 5 p.m. and by appointment. Next articleWe’re Looking For A New Food Writing Slave—er, Intern!